I want you to know, all 14 of my devoted readers, that at the first sign of spring I darted west to the Real Mountains to do some Real Hiking — no more of this flat-land fakery for me, by God. Danged if it ain’t still winter up there. 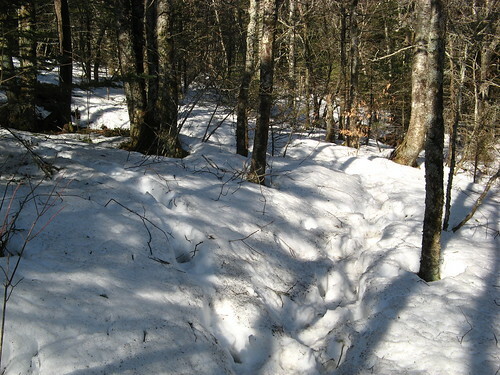 The last time I hiked at Grandfather Mountain (Dec. 6, 2009), I made it a mile or so up the Profile Trail before I concluded it was just too much like winter to be out there in my three-season gear. Yesterday we had our first unambiguously springlike forecast in the Triad — sunny, high in the mid-70s, no rain for days. The forecast for the Blue Ridge of western North Carolina was about the same, just 10 degrees colder. How bad could it be up there when it was so nice here? The Grandfather Mountain web site warned of considerable snow on the hill, but the weather forecast was so good I had to see for myself. Well, the snow was considerable. Above 5,000 feet it was everywhere — typically over a foot deep with a thin, sharp crust that felt just fine smacking into the shin mid-posthole. I came to a point where following other hikers’ footprints became pointless; the trail was blazed, but the blazes were too far apart to draw a line through the snow, so mostly it was too much like my college years — lots of tramping around hoping to get lucky. This little shot of my GPS track reveals the wanderings. The approximate route of the trail is the brown-and-white dashed line. Another hiker named Mike soon came along, hoping to find a trail in my hopeless snow tracks. I summoned him over to the last discernible trace of the trail, from which both of us tried one last time to find the route ahead. No luck. “Some days the mountain wins,” Mike said. True enough. It couldn’t have been more than a mile and a half to the tip of Calloway Peak, highest point on Grandfather Mountain, with around 700 feet of ascent. The trail was just switchbacks straddling a ridge. I had a map, GPS, compass, perfect weather, just-in-case survival supplies. But I also had two feet soaked to the skin, and a nagging suspicion that a mile and a half of flailing at foot-deep snow would stop feeling like recreation after about, oh, seven minutes. Back to the car I went. The stats on Saturday’s hike weren’t all that impressive: a not-quite-glacial four miles in four hours; maybe 1,300 feet of elevation gain. 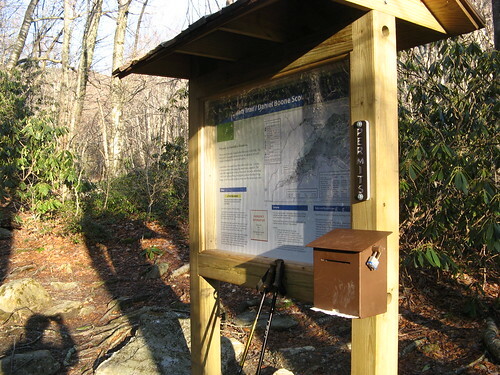 I started out at Mile 299.9 (click for Google map with GPS coordinates) on the Blue Ridge Parkway, also known as the Boone Fork parking area, and headed south on the Tanawha Trail till it ran into the Nuwati Trail, where hikers are required to fill out a registration form (mostly so S&R folks will know where to look if you come up missing). If you’re summit bound, from here you can either head north on the Nuwati Trail for three-quarters of a mile and turn west on the Cragway Trail, or turn back to the Tanawha and take it to the Daniel Boone Scout Trail — a steeper but more direct route to the summit. Either way it’s a non-trivial 2,000 feet of ascent. Cragway is prettier, but the hiking’s more complicated. The Scout Trail is mostly tree tunnel, but it gets you to the top faster. I went up the Scout Trail and came back on the Cragway, which seemed like the better option. Beginning of the Daniel Boone Scout Trail. Steep, rocky, full of roots. This is real hiking, even before the snow starts covering it. 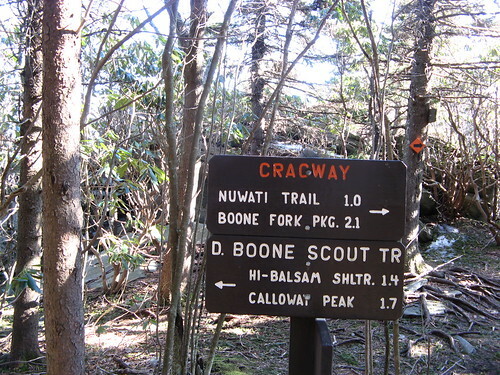 Junction of Scout Trail and Cragway near a formation called Flat Rock right at 5,000 feet. After this it got very snowy. One stretch of trail before the snow took over completely. On the way back, nice views open up from the Cragway Trail. One of the crags along the way. 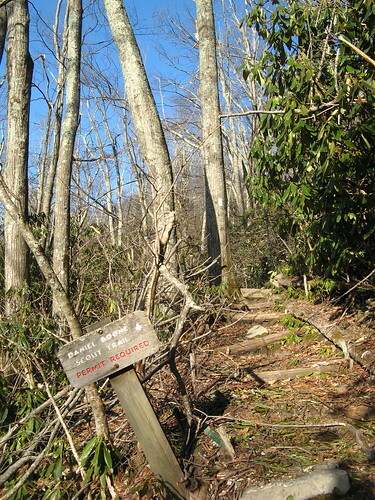 These trails are on the Blue Ridge Parkway side of Grandfather Mountain, and it’s free to hike in from Boone Fork, while it costs $15 to drive to the top of the attraction. There’s still a lot of rugged hiking available at the top so it might be worth the drive up, especially if you bring a carload. Keep in mind this a very popular attraction, especially in the summer when it’s sweltering in the flatlands; weekends are bound to be crowded. Weather here can change dramatically, especially near the summit. Even at the height of summer, a nice lunchtime in the low ’80s can turn into a frightening late afternoon in the low 50s with gale-force winds if a storm blows in. Always bring rain and wind gear, even when the forecast looks picture-perfect. Great place to hike if you arrive ready for anything. Hey Arleigh- my favorite ones out your way are Catawba Falls in Old Fort, and the Wilson Creek area up 181 toward Linville. There are a ton of sweet hiking trails/waterfalls along the main wilson creek dirt road that can be awesome day trips. 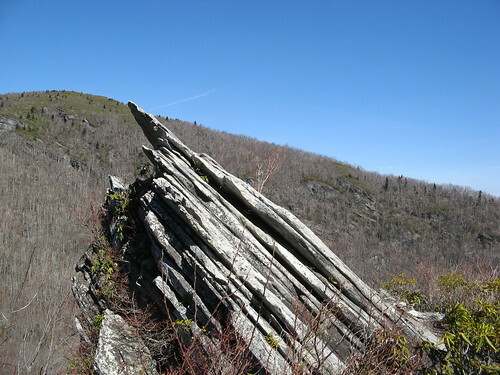 The Linville Gorge area is not far from there. I know I’m not Jordan, but I hope you like those hikes! Great report. Amazing to think that for the first time in years, there was snow – and DEEP snow – on the mountains all winter long. 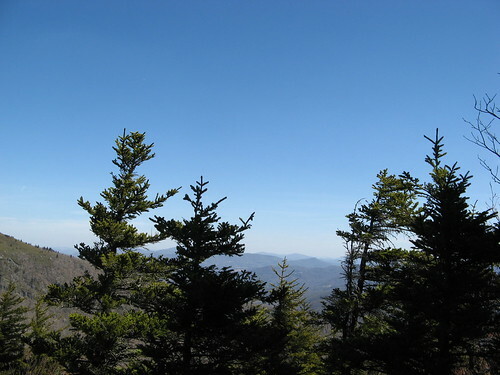 Mount Mitchell had over 30″ on the ground for a few weeks. This was one winter to remember. 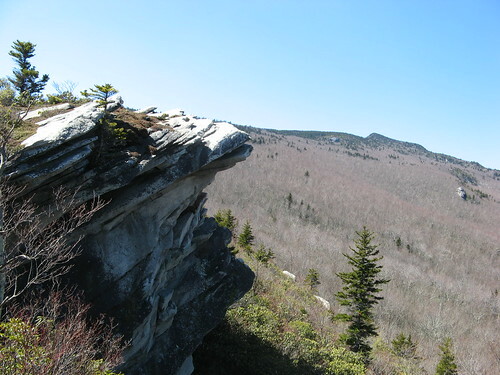 Grandfather Mountain is one of our favorite places, or at least one of mine, but I’ve only been up it in good weather. That ladder to the summit area is my least favorite thing, it’s like something from nightmares I had when I was a kid. Made me remember that I’ve been living in the lowlands for about fifteen years, I didn’t even know I had my shaky knees back until I started back down it. Am I right that there’s no cable to hang onto up top? Anyway, seemed like a terribly bad idea once I was faced with coming back down. Probably not even exciting if you’re used to it.